Now that the final week of Fortnite’s season has kicked in, Epic has released new challenges corresponding to the tenth week of season 7. The free challenges corresponding to season 7, week 10 are the following: Place a Mounted Turret or a Damage Trap in different matches, Search Chests at Lazy Links or Dusty Divot and Assault Rifle Eliminations. To place one of these items one you’ve picked up either, simply hit the build button (B on Xbox One and Circle on PlayStation 4) and then the trap button twice (X on Xbox One and Triangle on PS4), and you’re done. 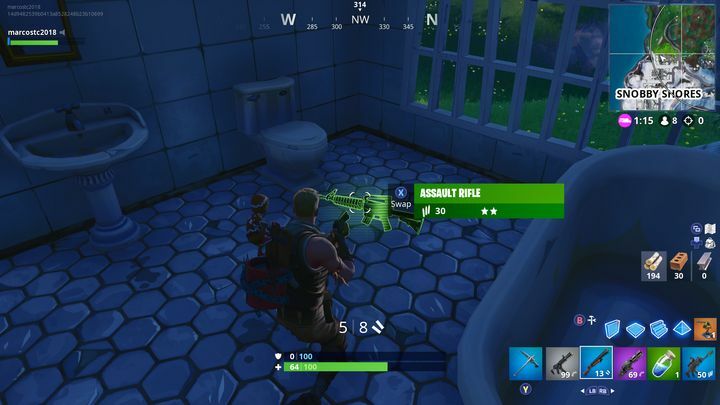 One you’ve placed 3 of these items (either one) you will be done with this challenge. 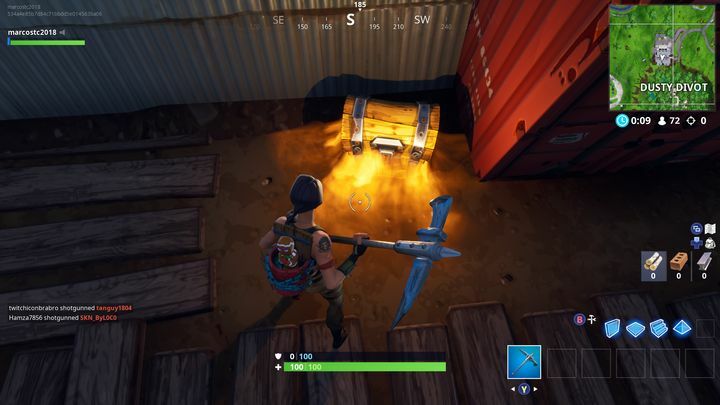 The second challenge involves searching chests at either of two locations: Lazy Links or Dusty Divot. 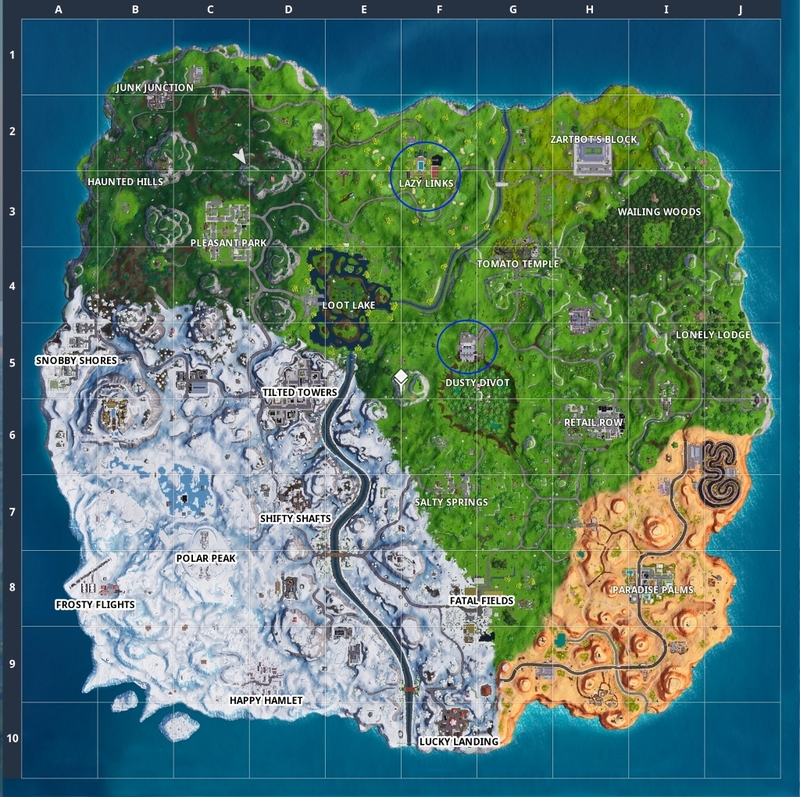 These locations are easy enough to find on Fornite’s map, but to save you the hassle I’ve marked both on the map below. Searching the chests is easy enough (just walk up to them in the game and hit the corresponding button), although given that many players will be landing at either Lazy Links or Dustry Divot to complete the challenge, you might find this a bit difficult with plenty of players roaming about with killing intent, especially if you’re playing Battle Royale solo mode. 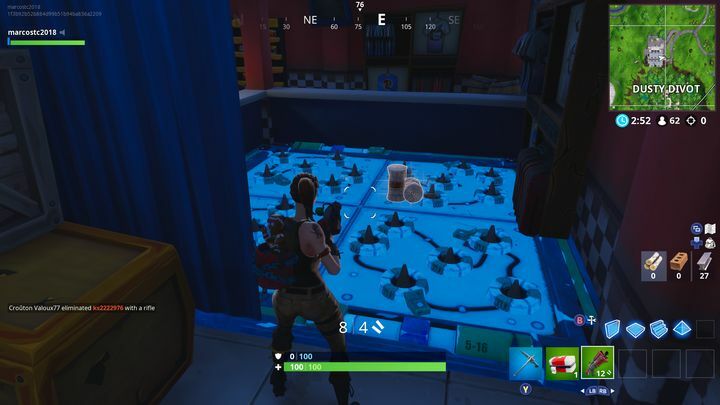 Playing a mode involving squads, though, might give you more breathing room to search the chests at Lazy Links or Dusty Divot. One you’ve searched 7 chests at either of these locations, you’ll have completed the challenge. These are easy enough to find, and you’ll likely come across more than one assault rifle while searching the chests required to complete the previous challenge too. Given what a cutthroat, competitive game Fortnite is, eliminating players is hard enough these days, although you might have a better chance of doing so if you team up with buddies or play any mode involving squads instead of diving into the game solo. Either way, this is a decent set of challenges to end Fornite’s season 7 with, although admittedly these aren’t the most imaginative we have seen in the season to date. Season 7 has featured some great moments, though, such as the memorable Marshmello Concert millions of people got to participate in last week. Bear in mind that Fornite’s current season will end on February 28, so you’d better take care of completing any remaining challenges before that date. And here’s hoping that Epic has plenty of interesting stuff in store for season 8, something we’ll know soon enough when Fortnite’ upcoming season kicks off in a couple of weeks.